The first thing we need to do is clearly define the difference between a dog that is “picked up” and one that is stolen. A picked up dog is one that was lost or perceived to be lost and a Good Samaritan took the dog to keep it out of harm’s way. Very few dogs are actually stolen. Stealing involves a person who commits a crime of intent by illegally entering your house, yard or vehicle and taking your dog. There is a big difference because the motive is different. We will cover the stolen dogs in a future article. But now let’s get back to the dog that was picked up by a well-meaning passerby. The type of dog most likely to get picked up is the small, friendly dog lost in an urban or suburban area. They may get picked up within minutes of going missing, especially if they are seen near a busy road. Larger, friendly dogs may get picked up but are more likely to have travelled a farther distance before they do. Many people are wary of larger dogs, or they don’t have a vehicle large enough to put them in, or they are transporting children or their own pets. It is simply easier to pick up a small dog than a large one. First and foremost, you must understand that the Good Samaritan meant well. But now the guessing game of understanding human behavior begins. Here is a little quiz. Let’s see if you can tell which of these scenarios will most often end up in a happy reunion. Somebody has lost their dog and I must try to find his owner. Somebody has dumped this dog or lost him out of negligence and I must rescue him. They don’t deserve him back and I will keep him or give him to Aunt Mary who really needs a nice little dog for company. I’m in a hurry and I can’t keep this dog so I will take it to a shelter (or vet clinic) that is in the town where I work. I can’t keep this dog but I don’t want to take it to the local shelter because they don’t have a good reputation, so I will take it to a better shelter or rescue where the dog can be adopted to a new home. I can’t keep this dog so I will research which is the correct shelter, stray holding facility or animal control facility that services this area and take him there. I will wait and see if the owners post signs and flyers and then I might give him back. If I don’t see any signs or flyers, they mustn’t really want him so I will keep him or give him away. I will wait to see if the owners offer a reward and then I will turn him over. f you guessed numbers 1 and 5 you are correct. Finders who proactively look for owners, and dogs taken to the animal control facility, stray holding facility or shelter that serves the area where the dog was lost are the dogs that are most likely to be reunited with their owners. Educating the public about this is a large part of what we do. But as you can see from the other options, there is a lot of human emotion in play. We see a lot of the “wait and see” method. The lesson we have learned is that it doesn’t matter which scenario played out. The key to getting your dog home is to generate sightings by using flyers and signs. You must “convince” the finder that you are desperately looking for your dog. If the finder has decided to keep your dog you will either make them feel guilty by the amazing search you are conducting or a neighbor will “rat them out” by noticing that they have a new dog that looks just like the one on the flyer. Put a sign in your yard as soon as possible. If the Good Samaritan was merely driving by and doesn’t live in the area, he may drive by again, checking for signs. Do the legwork of going door to door with your flyers. Talk to everyone you see. Use intersection signs at strategic locations throughout the area. They are an invaluable tool to alert the neighborhood that your dog is missing. File a lost dog report at www.helpinglostpets.com and leave a flyer with your local police station and your animal control facility. Do the same for every vet clinic, animal shelter and rescue in a 50 mile radius. (You may need to expand this) Create a paper trail showing that you are actively searching for your dog. This may be invaluable if there is a question about ownership. Use traditional and social media and Craigslist to get the word out. Put an ad in your local newspaper and call your local radio station. Remember that not everybody has a computer. Look at the map. Where does the road go that you suspect that your dog was picked up on? Think about the traffic patterns, the commuters and the places of employment nearby. Get flyers out to those towns and places. You will find many other suggestions for generating sightings on our website. Print hundreds of flyers and use them. They don’t do any good sitting in a stack on the kitchen table. Quickly spreading the word is the number one way that a small friendly lost dog will be reunited. Get going now! Click here to go to Part 3. 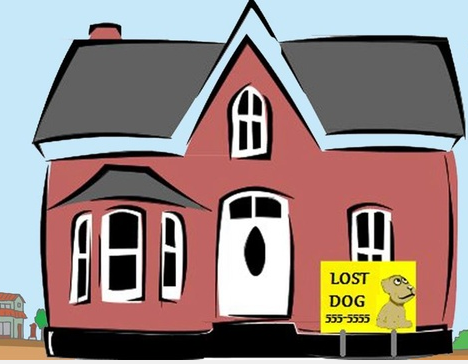 Friendly Lost Dog Series, Friendly Lost Dog Strategies, Recovery Procedures Good samaritan, Helping Lost Pets, rescue, stolen. permalink.